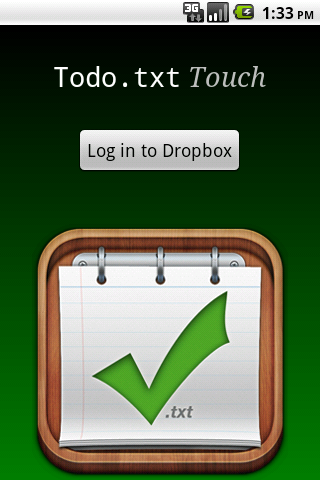 My new Android app Todo.txt Touch is now available in the Android Market. Search for “Todo.txt” in the Market, or scan the QR code below on your Android device to get it. The latest release 14 includes a gaggle of bugfixes, a couple of new features, and our gorgeous new project icon that looks great on any screen resolution courtesy of John Rowley. You saw the full screenshot tour last week. The biggest feature addition in this release is standard Android-style task search: tap your device’s search button to try that out. The prettiest bugfix is our new login splash screen, shown here, which appears when you initially launch the app or log out of Dropbox. 2. Good karma and the satisfaction of knowing you’ve supported the whole Todo.txt project. Don’t underestimate #1. That convenience will be worth it, I promise. There are tons of interesting ideas and features we hope to build into this app, and updates will come frequently. You don’t want to have to do it manually. The revenue from Market app purchases will help recoup some of my expenses from the past five years of running the Todo.txt project, like web site hosting fees, domain name and Market registration. These costs are admittedly low, but a two-dollar purchase price is, too. I don’t expect sales will be through the roof, but if by some stroke of luck the app goes viral, I will share revenue with the core contributors. Again, the app will always be available for free on the web if you’re unable to purchase it. But, I’m thrilled to have a presence in the Android Market and I’m looking forward to adding more features soon, like offline use, a homescreen widget, Share menu integration, location-based magic, done.txt support, localization, and more. If you do buy the app in the Market, please rate and review it. As always, the Todo.txt tools are open source projects built by enthusiasts and volunteers in their spare time. Thanks to all the Android developers who have helped build Todo.txt Touch and who have shared knowledge about mobile app development. I’ve learned so much in this collaborative process, especially in the last two weeks, and I look forward to learning more. Interested in getting involved? Browse and fork Todo.txt Touch’s source code, then get in touch on the mailing list. Is there another way to donate my $2? I thin the program is worth it (even without the auto updates from the Market) as I use my apps account on my HTC Desire I have no associated Google Checkout. How can I pay you for this, Gina? I went out and bought your app, out of appreciation of all your work on the twit network and also for I do like the idea. I’ve been using Google Tasks for my simple task management and overall it works fine. However, the idea of being able to add new tasks off my shell access and have it sync up in Dropbox is a fantastic idea, coupled with the Android app could solve a lot of my requirements. 2) being able to see the first few import tasks in a widget. I don’t think people who mind spending $2 will be swayed by automatic updates 🙂 I think that the $2 buys you a very nice application from a dedicated and inventive developer, plus free upgrades to any future versions. If you’d rather buy a small coffee to keep you awake while you update manually, good luck finding a free app of same quality. This is really pretty awesome, Gina. I’ve been watching your tour, and the app looks more and more like something I’d use. I’m also really looking forward to checking out the github project as well as the app itself. I think it’s VERY cool that you’re releasing the app free on github; I think that’s a great strategy. Heading off to buy it on the Market now! *grin* Thanks again. I’ve become quite dependent on my Google Tasks setup and I’m not sure that I can easily change away from it now. However, come payday I plan to buy your app for 2 reasons. The first is I like to support Android devs… and the second, you made BSG references in your preview pictures on the market. I just got the market version. I use GTasks on my phone for time sensitive tasks, but after hearing you talk about your CLI todo.txt project on TWiG (and this app) I figured that I’d give it a try. I’m a diehard Dropbox fan (was a beta user) and I see the value in using plaintext for storing things. I’m going to use this app to keep track of some of my “someday” tasks and I’ll see how it goes. I’m optimistic about it becoming my go-to app. The app looks great and I hope it does well for you in the market. I’m sure I’m not the first one to figure this out, but I put the todo.txt file in the Notational Velocity folder in Dropbox and now it shows up in NV, and I can edit it on my desktop in NV and it syncs back. I add most of my tasks at my desk. When I’m mobile, I use simplenote to dump ideas and thought and things I hear on podcasts out of my head. But now my tasks are in todo.txt. 2nd I love the tool you made, but I don’t use your CLI Todo – just a plain ole text doc. One thing though I wanted to know for use non-terminal users, is there an easy way to mark things as done? or to put in categories? Anything we can do in a plain text doc to organize? I love the android snyc, and will use it anyways, and happy to have paid the 2$ or 1.78â‚¬’s 🙂 just would like to know if there is any “best use” for those with a touch less “geek” in us. One suggestion for desktop Mac text editor – TextWrangler is recommended. It does pick up the automatic update from a Dropbox save event if there is a phone task update. The built-in Apple TextEdit does not seem to do this and that has caused some data sync issues for my wife. Gina, You really need a way to share these great nuggets of wisdom to the rest of the world. IE: Facebook and Twitter. I can’t seem to find the share button anywhere. The .2 update that just came in is great. Much easier to add notes now, and pretty! Tnx for the app, I installed it a couple of days ago and i really like it! I’m a designer and i’d like to think / help you with the graphics / interaction design (if needed). What a concept! I love your solution. One tangle for me. The CR/LF is not preserved except to designate a new record. I often have a todo list with the first line being the subject or main ‘heading’ of the note, with ‘bits’ of that note delineated by separate lines. each on a separate line – makes it easier to read and edit later. Could the records be broken by CR/LF as they are, but allow a LF-only to break the individual lines of the record? Thanks Gina – love those ‘simple’ solutions. Purchased the app a couple days ago and love the DropBox integration. Also have the CLI running on the Mac. I would add my voice to any suggestion to create a Google Widget for the app as well.